That Mormons wear “special” underwear has drawn curiosity from some and ridicule from others. Mormons themselves call the underwear “garments,” as they’re seen as distinct from normal underwear. In fact, they’re very different. Mormons see this “underwear,” their garments, as very sacred. Indeed, not all Mormons wear these garments. There are very specific guidelines to wearing it properly. This may seem strange, especially today, when religious rituals and traditions and guidelines may seem out of place. But for those who wear Mormon underwear, to wear those garments is an act of faith and devotion. Beyond this, religious or special clothing is common to many faiths. And, like religious clothing in those many other faiths, garments are worn daily to show constant respect for the Lord and temple covenants. Mormon garments are similar to other underwear in make. Garments are available in cotton, polyester, or nylon. With the exception of colored garments only obtainable by active-duty military members of the Church, garments are always white. Each set of garments has a top and bottom piece. The top piece resembles a T-shirt – it covers the shoulders completely and hangs below the waist. The bottom piece resembles boxer-briefs, but extends to the knee. The garments cover a large portion of a Mormon’s body – the intent of the design is to promote modesty. Garments should always be completely covered by outer clothing. Also, they are worn directly against the skin – no other underwear is worn underneath. Women wear their bras on top of the garment. All other types of underwear are simply replaced by the garment. Mormon underwear can be removed in a few situations, such as bathing, swimming, extensive physical activity, or marital relations. The Mormon Church doesn’t provide an official list of when to wear garments and when not to. This is left up to the individual. God won’t strike down people who wear garments inappropriately or take them off too often, nor will the Church punish people for “not wearing them enough.” Why would the Church investigate such a private matter? Rather, Mormon leaders counsel members to wear the garments always, except for activities that don’t permit it (again, such as swimming), and not to look for excuses to take them off. Mormons only wear garments after they’ve received their endowment in a Mormon temple. In the beginning of the endowment ceremony, they receive and put on the sacred garments, which they will promise to wear for the rest of their lives. 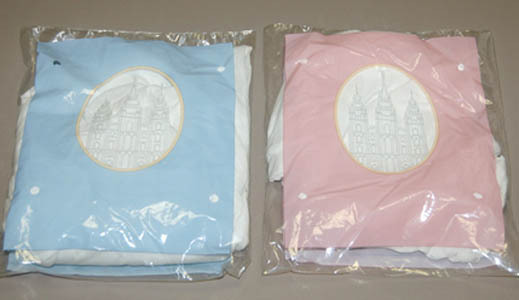 The garments symbolize covenants (or mutual promises) made with God, and Mormons treat them with great reverence, which also symbolizes the reverence they give to these sacred covenants. The symbolism of the garments is so precious and sacred that Mormons will not discuss it outside of the temple. After all, Mormon garments themselves are treated so very lightly by the world and, in Mormon belief, it’s never appropriate to present the most sacred beliefs to those who will only mock, since they don’t know enough to understand. Therefore, Mormon ceremonies are often incorrectly called “secret,” although sacred is the proper word. Some of the symbolism of the garments, however, is scriptural. In Genesis, the Lord clothes Adam and Eve with coats of skin to cover their nakedness, after they became aware of that nakedness. Exodus 28 mentions “holy garments” that Moses was commanded to make for Aaron. Special, holy clothing is part of divine teachings, and part of covenants made with God. Mormons who faithfully wear the garments are promised that they will be protected. This isn’t to say that Mormons believe that their garments are physically some kind of impenetrable armor (although there are anecdotes of it serving that way). The promise is of a spiritual nature, and the protection is spiritual. In short, Mormon underwear is not secret or magic, but sacred. There is nothing to hide. Mormons would just have this symbol and reminder of their covenants with God be treated with respect.